Another hand shot up, the little girl squirmed, stretched and strained to get the attention of Jim Herbers, who was giving classroom workshops to Kindergarten and Grade 2 students at Edmonton’s Holyrood Elementary School on May 31. Finally… relief. The little girl was chosen to answer Jim’s question: “Does anyone know what this is?” Jim pointed at a picture of the night sky. “That’s Orion’s Belt,” The little girl beamed as she looked at her classmates who were quietly nodding in agreement. This question would lead them to many more that would take the students throughout the universe, finally landing them on Earth for a discussion of ecosystems and the biodiversity of life on this planet. 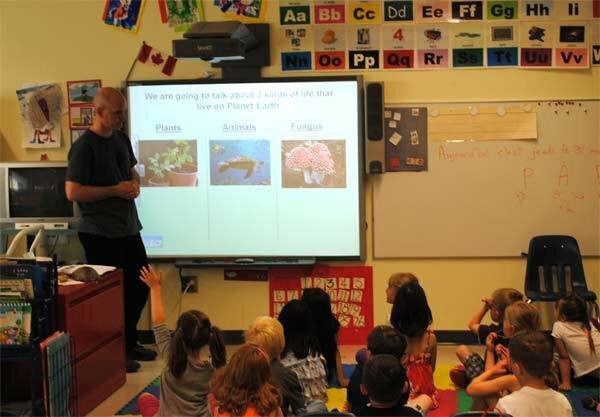 Jim Herbers, Director of the ABMI’s Information Centre was speaking to the enthusiastic children about biodiversity and the different forms of life surrounding all of us. Jim’s presentation was certainly different to the ones that he is used to giving to the ABMI’s stakeholders in government, industry and ENGOs; he admitted that this presentation made him more a bit more nervous. However, he needn’t have worried as both the presentation and the activities were big hits. The children relished in asking questions and sharing their own experiences about nature trips that they had shared with parents to all areas of the provinces (although Jasper proved to be the most popular) and the different plants and animals that they had seen or wished they had seen. Twelve stations with specimens of various life forms were set up around the classrooms and the kids eagerly ran from station to station to give their best shot at correctly identifying the type of life form in each of the boxes. We were lucky enough to have a wide variety of specimens including a wolf’s paw, a penguin, a Big Horned Sheep horn, a deer antler, a Northern Flicker, some insects, lots of fungus and lichen, and plants. We even did our best to fool the kids with a simple rock, but only a few of them fell for that one. So, what does Orion’s Belt have to do with biodiversity? It provided a great entry point and context for the kids to understand the wide expanse of the universe, why the Earth is unique and finally where plants, animals, fungus and humans fit into the larger picture. By the end of the class, the kids were experts on the amphibians, reptiles, mammals, plants and fungus. The biggest lesson for us was something we knew all along: kids love learning, especially about things they can touch, smell, question and interact with. The ABMI is in a great position to provide knowledge and opportunities for kids to learn about biodiversity and to spark the curiosity of our future scientists to learn and possibly to study and help us understand more fully the complexities of biodiversity.